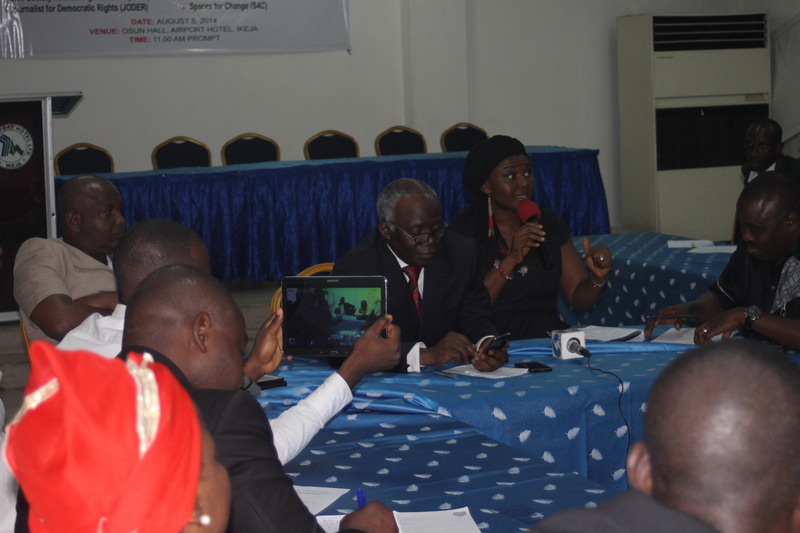 A one-day roundtable discussion on the theme: ‘Save Our Democracy Roundtable’ was jointly organized by Civil Society Network Against Corruption (CSNAC), Network on Police Reform in Nigeria (NOPRIN), Journalists for Democratic Rights (JODER) and Spaces for Change (S4C) in Lagos on Tuesday, 5th August, 2014. 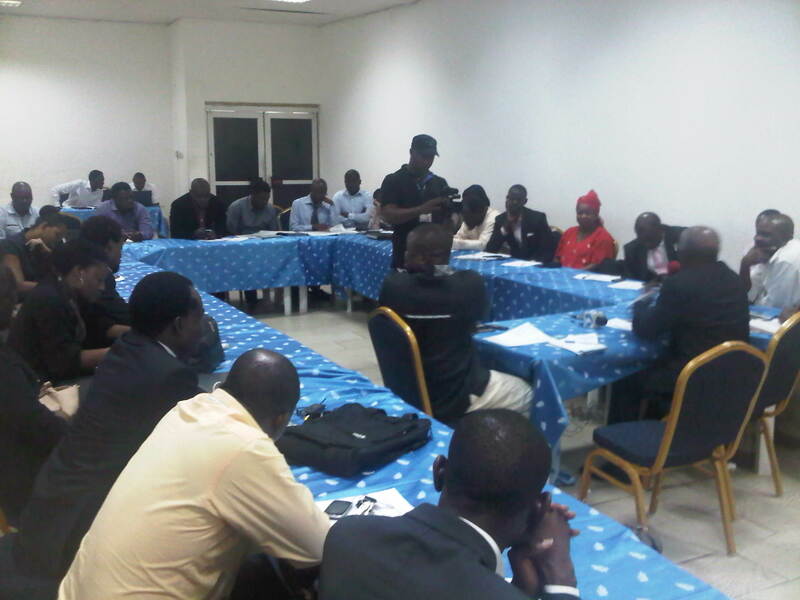 The roundtable was organized to brainstorm on the declining undemocratic tendencies marked by high level of executive lawlessness, legislative anarchy, corruption as well as growing culture of impunity in Nigeria.The roundtable was held against the backdrop of heightened insecurity, abuse of political power, politicization of security agencies and militarization of electoral process as well as incidents of politically-motivated impeachments of democratically elected state executives across the country. The need to save democracy in Nigeria has become a crucial and urgent challenge for concerned citizens irrespective of political, social and sectarian tendencies. Within the context of the ensuing rat race for power, the country is gradually reclining into cesspit of lawlessness and impunity, symptomized by militarization of electoral process, deliberate intimidation of political opponents, monetization of elections as well as instigation of impeachment against elected governors in the opposition political parties. The one-day roundtable was attended by 35 participants drawn from broad spectrum of civil society groups and platforms of mass organizations. The roundtable benefitted from presentations by resource persons; namely Mr. Femi Falana (SAN), Mr. Wahab Shittu and Mrs. Victoria Ibezim-Ohaeri, executive director of Spaces for Change who respectively led discussions on 3 thematic areas namely; (i) The Nigeria Police and Freedom of Expression (ii) Democracy, Impeachment and the Constitution: Nasarawa State in Focus (iii) Corruption and Governance. 2. That the ruling class in Nigeria continues to exhibit disdain for civility and democratic standard which cast them in the mould of citizens that are above the law of the land and by extension superior to other stakeholders in the polity. The roundtable observed that the political class in Nigeria, having failed to provide leadership and guarantee social security, now revue in the shameful act of negotiating with well-connected criminals in the society who enjoy the patronages of high profile accomplices amongst the elite. 3. That militarization of electoral process as witnessed during the Ekiti state governorship election and now currently being played out in Osun state is obviously not about maintenance of law and order but absolutely a gross abuse of power by the federal government. The roundtable further observed that the so-called success of the recently concluded governorship election in Ekiti state could not be justified based on the fact that such high presence of security forces deployed in the staggered governorship elections held in Edo, Ondo, Anambra, Ekiti and the forthcoming in Osun states could not be sustained in the forthcoming general elections in which governorship elections would be held in not less than 30 states. The roundtable therefore noted that a free and fair election through a credible process could not be guaranteed under a militarized environment where intimidation and harassment of political party stalwarts and voters become the order of the day under the pretext of providing security. 4. That there is the need to consistently interrogate democracy as currently being practiced in Nigeria with the view to ensure that ordinary citizens benefit maximally from governance. The roundtable regretted that Nigeria is operating ‘kill and go’ or ‘AK-47’ democracy where free, fair and credible elections could no longer be guaranteed in the light of the unrestrained scramble for power within the rank and file of the political class. 5. That there is gradual and consistent erosion of ideals of issue-based democracy by political parties and actors who now brandish ‘stomach infrastructure’ as replacement for party manifesto and program-based electioneering campaign. The roundtable regretted that the adoption of stomach infrastructure by the political class is psychologically traumatizing and dehumanizing as it leaves the electorate with little or no choice to make in the electoral process. The roundtable further noted that the ideology of ‘stomach infrastructure’ is a direct consequence of bad governance and mismanagement of resources as manifested in anti-people policies which continue to foist harsh socio-economic conditions on ordinary citizens. 6. That the gale of impeachment threats against state executives by state legislators is condemnable and highly reprehensible. The roundtable noted that the impeachment charade in Nasarawa state was a glaring assault on constitutionalism and that the demand of the House of Assembly for the disbandment of the probe panel set up by the Chief Judge of Nasarawa state amounted to reckless abuse of judicial process. 7. That the deployment of military personnel to provide security for Assembly members during sittings, especially those in connection with impeachment proceedings, is a clear indication of Federal and presidential culpability in the exercise. 8. That the frequent questionable changes in the leadership of the Nigerian National Petroleum Corporation (NNPC) in the last 3 years constitute a worrisome trend that must be challenged by Nigerians who must demand explicit explanations and clarifications from the relevant authorities. 9. That the Presidency handling of the abduction of Chibok girls so far leaves much to be desired. The roundtable noted that the recent controversy surrounding the presidential largesse which exchanged hands during the visit of parents of Chibok girls to the president was a huge embarrassment to Nigerians and the country. 10. That the private public partnership (PPP) exercises supposedly aimed at privatizing public corporation for efficient service delivery have turned out to be a huge fraud through which public resources are transferred to few private hands whose sinecure interests are further curiously being corruptly feathered by continuous sourcing of financial aids and credit facilities to bail out corporations that have been supposedly privatized. 11. That the declining state of Nigerian health sector has reduced most of our tertiary health institutions to mere consulting clinics. The roundtable condemned the habitual practice amongst political office holders and the political class to travel abroad for treatment when Nigerians are groaning under perilous health care facilities. 1. Noting that corruption has become more endemic in Nigeria than ever before, the roundtable demand the release of the outcome of various panels set up to unearth corruption and financial management as well as the prosecution of those found guilty of financial and economic crimes. 2. The roundtable call on the civil society to insist on due process in all democratic engagements and to, as well, demand supremacy of the rule of law and the affirmation of popular will of the people. 3. The roundtable call for the reassessment of the impeachment clause in the 1999 Constitution as amended by the national assembly with the view to properly redefine what constitute ‘cross misconducts’ as well as reconsideration of the power of the legislators in the impeachment process in Nigeria. 4. The roundtable admit to impeachment as a legal and political weapon that should be sparingly used to consolidate separation of power, transparency, accountability, rule of law and constitutionalism. Meanwhile, it’s employment must be strictly guided by constitutional provisions and supremacy. Conducting impeachment proceedings outside the precinct of the Assembly complex of the House concerned is unconstitutional and strongly condemned. 4. The roundtable call for improvement in the engagement of the democratic process by civil society and stakeholders in the political process. The roundtable demand improved deployment of freedom of information (FOI) Act by stakeholders to engage governance and the democratic process with the view to hasten de-monopolizing of public information and democratization of the rights of the citizens to be duly informed. 5. The roundtable admonish Nigerians to change their attitude towards political engagement and be prepared to engage politics with the view to connecting with potential political aspirants that share the same genuine aspirations with those of ordinary Nigerians. To watch part of the Victoria Ohaeri’s speech, please click here.